Sylvia can’t imagine why anyone would ever try. She had left rural Newfoundland as a scrawny, shy girl who was too smart for her own good. When she dragged herself home for her cousin’s wedding, she couldn’t believe how much had changed—or how much had stayed the same. Ten years older but no less fixated on an exit strategy, Sylvia returns to confront the person she left behind: her younger self. When she left, she was Miss Sylvia Pride, a fisherman’s daughter without an education, money, or any sophistication. Returning now, she is a different person. Whether she wants to or not, Sylvia reconnects with her long-lost best friend. While they are unpacking things left unsaid for years, Sylvia’s life gets more complicated when her husband arrives from Boston. Surrounded by the successful families in her hometown, and with her own marriage on the brink of collapse, Sylvia finds herself at a crossroads. Is there such a thing as happily ever after? And can the family and friends she left behind now help her find it? 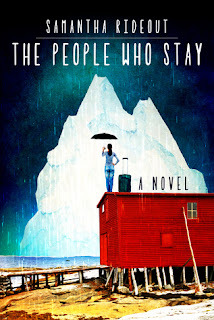 The People Who Stay is a tale of love and redemption in which the heart of family beats like the relentless tide against the rugged Newfoundland shores. The first few chapters were intriguing. A young woman with marriage troubles heads back to her hometown for a friend's wedding. I can relate with growing up in a small town, so I understood some of her problems with returning home. The story quickly turns into a slow and drawn out rekindling of friendships and marriages, constantly bringing up the past and troubles each of the main characters had when they were younger. The middle of the story was a little slow. Will Sylvia stay with Ty? Will she push him away? Will they have children? Several questions kept running through my mind and it took until the last twenty pages for my questions to be answered. The end of the story did pick up pace a little, but I never fully connected with the characters. It was a charming story about family and friends and the struggles of real life, but it really wasn't for me. I would still recommend this book to others.